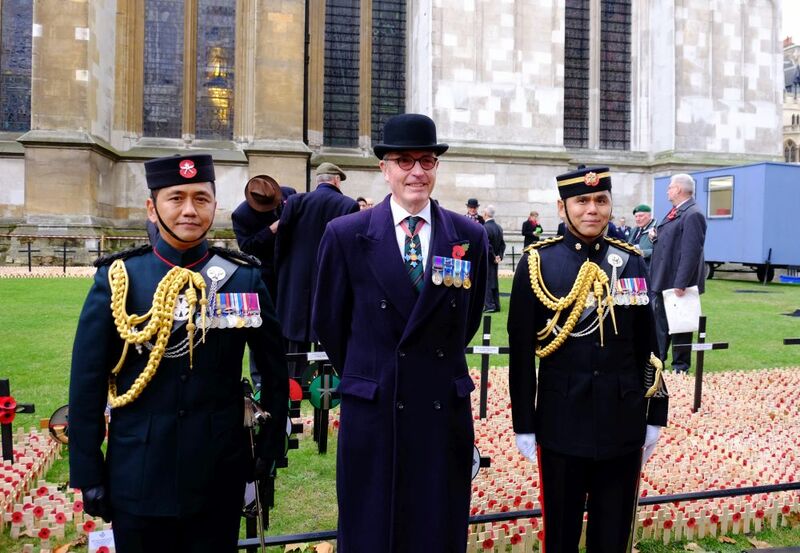 Today members of the Brigade and representatives from all the current and past regimental associations plus key members of the Gurkha Welfare Trust and the Gurkha Museum gathered at the Field of Remembrance at Westminster Abbey. The event is organised by the Royal British Legion Poppy Factory as part of the annual Poppy Appeal commemorations. This year 380 plots were laid pit in the names of military organisations and associations. Remembrance crosses are planted in these plots – often with hand written messages from family, friends or colleagues. 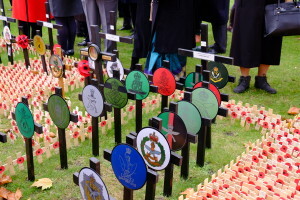 The Field of Remembrance was started in 1928 by Major Howson MC, the founder of the Royal British Legion Poppy Factory. The garden area allocated to the Gurkhas. Major Howson and a few disabled ex-servicemen from the Poppy Factory grouped together around a battlefield cross and with trays of poppies, invited passers-by to plant a poppy in the vicinity of the cross. Since then, the Field has evolved to include a wide range of military interests. Ex-Servicemen and Woman, both young and old turn out for the opening ceremony to pay their respects to their colleagues. 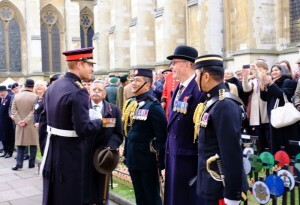 On this occasion our current Queen’s Gurkha Orderly Officers (Captain Ganesh Tamang and Captain Lalitbahadur Gurung) and Colonel (Retd) David Hayes were presented to HRH The Duke of Edinburgh and HRH Prince Henry or Wales (Prince Harry). Prince Harry and Captain Lalitbahadur Gurung have trained and served together. 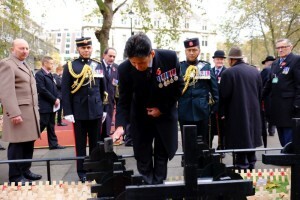 After the service at the Westminster Abbey gardens the Gurkha community moved to the statue of Field Marshal The Viscount Slim on Whitehall and a small number of wreaths were laid as a mark of respect. Our two Queen’s Gurkha Orderly Officers were working hard today and took up position on either side of the statue. 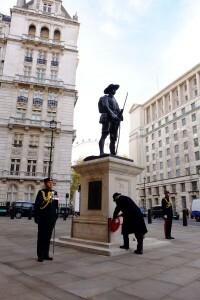 Then the party moved to the Memorial to the Brigade of Gurkhas on Horse Guards Avenue, Whitehall, London. This was unveiled by Queen Elizabeth II on 3 December 1997. 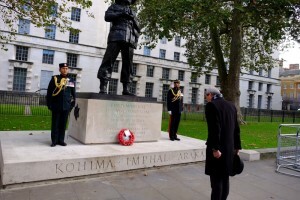 This was the first memorial to Gurkha soldiers in the United Kingdom, and was occasioned by transfer of their headquarters and training centre from Hong Kong to London in 1997. The sculptor was Philip Jackson, working from a statue of 1924 by Richard Reginald Goulden in the Foreign and Commonwealth Office, and the plinth was designed by Cecil Denny Highton. 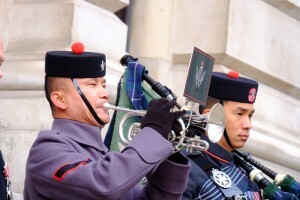 A small service took place with Last Post performed by a bugler from the Band of the Brigade of Gurkhas and a lament performed by a piper for the Royal Gurkha Rifles.